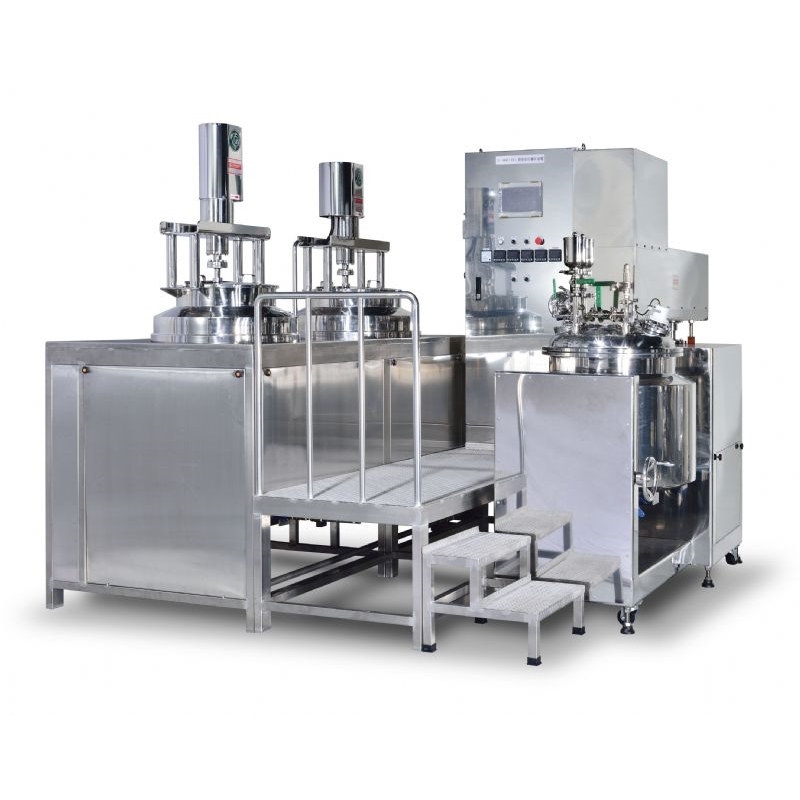 The Automatic Vacuum Emulsify Mixer (SY-HME) has one blades-mixer for high viscosity material mixing and one high speed homogenizer for emulsification. The blades-mixer has scrappers to scrape the material stuck on the inner surface of mixing bowl to prevent dead corner from happening. The blades-mixer produces downward current to mix and push material going through homogenizer continuously. The homogenizer head of the Automatic Vacuum Emulsify Mixer consists of high speed rotor and stator. There is pressure difference produced by the high spinning of rotor and stator, inside the homo-head from bottom to top. Shearing, breaking, mixing and emulsifying are happening during the material going through homo-head. The emulsified material is gushing out from the top of the homo-head and coming back to the homo-head again by the down force of blades-mixer when the upward force fading away. Based on the aforementioned description, The Automatic Vacuum Emulsify Mixer(SY-HME) is widely applicable from high to low viscosity material. 50,000 C.P.S. of material could be emulsified by this machine. The raw material could be sucked into this mixer directly by vacuum function. Vacuuming, heating, cooling could be done in one step production in this mixer. Pulverization, emulsification, mixing, homogenous dispersion could be done in a very short period of time. Blades-mixer and homogenizer could also be operated independently. The control system is fully automatic. Touch bottom, timer and process recorder are parts of control features. The discharge part materials are made of stainless steel. Under vacuum operation this mixer could prevent outside air and bobbles from entering into mixing chamber and occurring altogether. CIP system could be installed in this machine.